Cartamundi Ireland Giving Tree 2016 - Cartamundi Ireland Ltd. The Giving Tree is a charitable initiative started by Hasbro Ireland, now Cartamundi Ireland Ltd. in Georges Court in 1986, which has become a wonderful example of local businesses and the community working together to help others at this time of year. 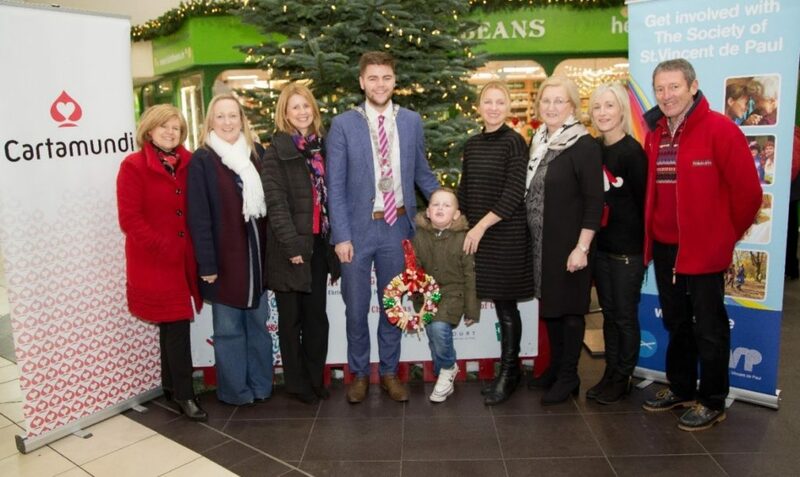 Mayor Adam Wyse was delighted to launch this year’s Giving Tree as ‘a symbol of the wonderful community spirit that is found in Waterford City combining local businesses, families and the community working together to help those in need’. He paid tribute to the efforts of Cartmundi Ireland Ltd. and Georges Court in maintaining ‘this unique Waterford Christmas tradition which embodies the true meaning of Christmas’. Families, Local Schools and Children are asked to get involved by making Christmas Tree Decorations and to bring them in and hang them on the Giving Tree in the centre of Georges Court Shopping Centre. Each decoration will be matched by a game from Cartamundi Ireland Ltd. to go to the St. Vincent De Paul for their hampers for children who are in need this Christmas. The Cartamundi Ireland Ltd. Giving Tree at Georges Court will be in place from Monday 12th December through the Christmas season until Friday 23rd December. Staff from Cartamundi Ireland Ltd. will be on hand each day from 10am–4pm and a free gift wrapping service will be in operation with donations going to a local charity. The Cartamundi Ireland Ltd. Giving Tree at Georges Court is a real example of Waterford people and businesses coming together to make 2016 a Christmas to remember and to help the people of the area who are less fortunate. Georges Court and St. Vincent de Paul were delighted that Cartamundi Ireland Ltd. have come on so readily as sponsors of this year’s Giving Tree and are looking forward to another successful Christmas Season. Georges Court Shopping Centre is home to a range of local, national and international stores, cafes and restaurants for your shopping and leisure enjoyment in the heart of Waterford City since 1981. Are you a school, nursery or crèche wishing to take part in the Cartamundi Ireland Ltd. Giving Tree? Please Contact Us.